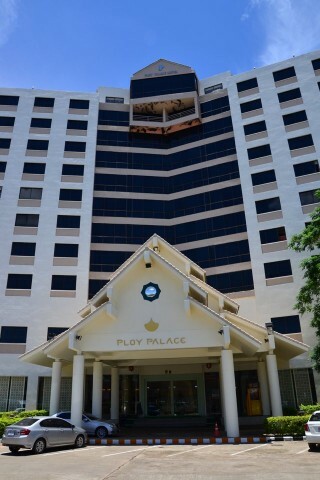 In recent years, the Ploy’s management has done a commendable job of upgrading this huge fortress-like upscale hotel located a 15-minute walk west of the river. Ad Book now! Rates from US$34++. Average rating 8.1 from 604 reviews. The lobby greets you with high ceilings, fresh lotuses bobbing in porcelain vases and silk-wearing staff members who are so attentive that they can come across as overly gushy. A lift takes you up to four different types of rooms spread over 10 floors, each with a tinted wall-size window. Some of these afford tremendous views towards the river while others look towards the back; we were offered the regular standard rate for a river-view room. The standard that we checked out came with newish wall-to-wall carpet, free WiFi that worked well, widescreen LCD TV built into the wall (though few English channels), desk, table with cushioned chair, fridge that was overly stacked with minibar items, very cushy bed and marble bathroom with tub and four mirrors set up to allow you to see the back of your head. Glass features are done up with subtle Japanese-style paintings of birds and bamboo that light up yellow when you turn on the mood lights. The lack of in-room safe is surprising in this price range, though valuables can be deposited at reception. The hotel has a small outdoor swimming pool on the third floor, a lounge with great views on the 10th floor and a restaurant near the lobby where a very good buffet breakfast is served.